Is Tesla the Leader We Should Really Be Looking At? One of the most challenging aspects of being a speculator, in any form, is simultaneously having strong opinions grounded in your core process while also being able to continually reevaluate that thesis to see if it continues to stand up to the scrutiny of markets. In other words, we have to do our homework, place our bets, track our bets carefully while constantly reevaluating them to make sure our core thesis is intact or has improved, all the while scouting for new bets and fresh opportunities. Tesla is a name I rarely trade, and that goes double over the last several months or so as CEO Elon Musk has put himself in the crosshairs of the SEC, shareholders, pundits, and short-sellers alike through no fault of his own. Indeed, the upside of a charismatic, original CEO sure helped TSLA years ago during its one-way freight train rally from the $30s into the upper-$300s starting in 2013. 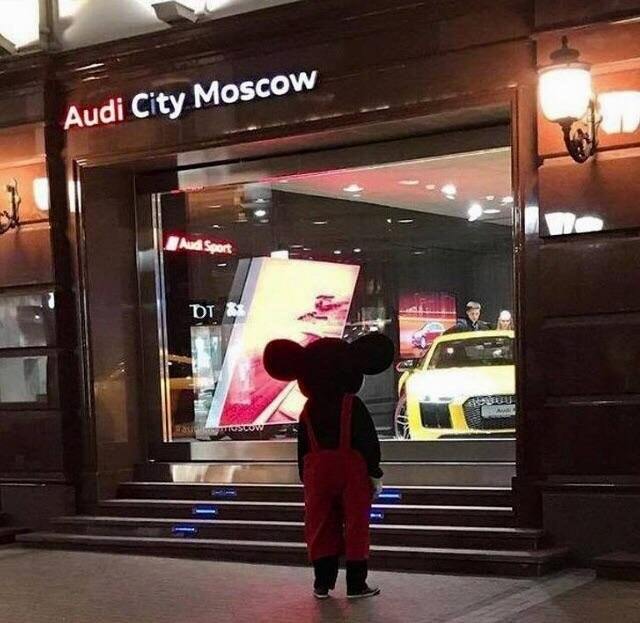 But the downside is that the market needed some time to truly process how risky both Musk's quirky nature as well as the constant barrage of bear arguments about TSLA's fundamentals truly were. Thus, for a good while inside Market Chess Subscription Service we essentially decided to lay off the action in TSLA, and for good reason--The share price violently flopped around based on the latest (mostly Musk) headlines, and seemingly trapped just about everyone involved. Now, however, the stock is acting much better and has been since late-October, a week or so before Halloween. 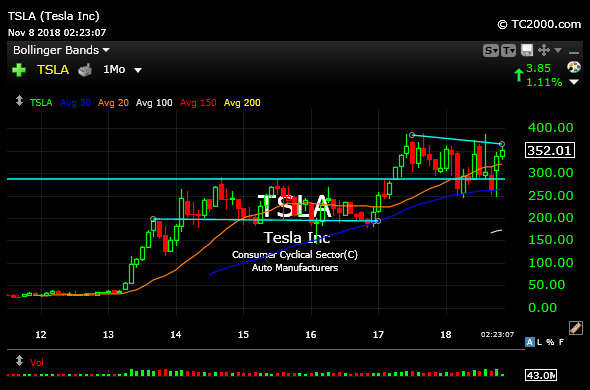 Bears were unable to take TSLA down when the market was correcting more sharply, a loss for them by any measure. And make no mistake about--Tesla remains easily one of the most heavily-shorted large cap names traded on the Nasdaq. If shorts are wrong, it will be a very painful ride above $400, as seen on the first monthly chart, below. Note how relatively calm this long-term chart is compared to the near-term roller coaster both Musk and the stock have been on for a while. That should be considered a bull victory, in and of itself. 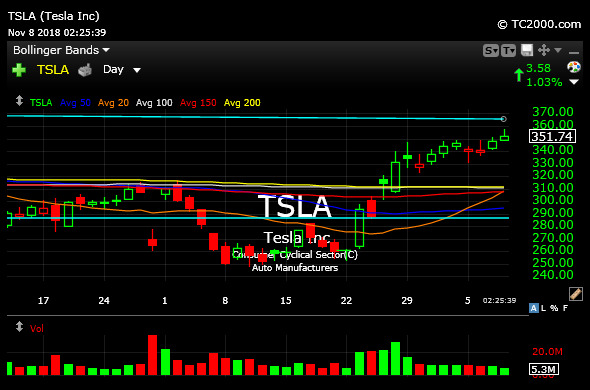 The second chart is of the TSLA daily timeframe, showing the progress in recent weeks. TSLA, simply put, is a much better daily chart than all of the FANG names, plus AAPL right now, which is something I want to see through in terms of whether the name can assume a main leadership role into the end of 2018 and beyond.